An extensive and significant Graeco-Roman town comprised of houses, workshops, public and private baths and cemeteries has been found. 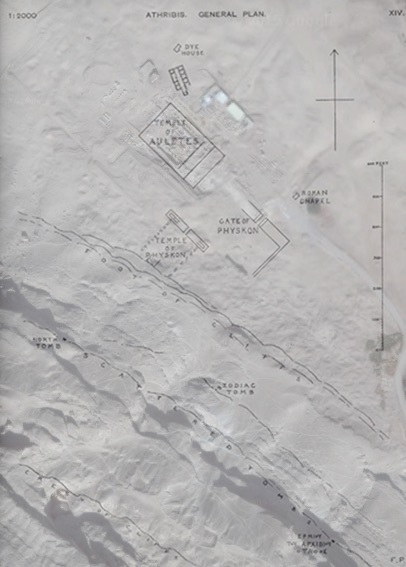 This site near Wannina, in the Sohag Governorate, excavated under Petrie, should not be confused with another Athribis in Lower Egypt (near Benha). Catalogue of Egyptian antiquities: found by Prof. Flinders Petrie and students at Memphis and Athribis, 1908 ; exhibited at University College, Gower St., London, June 29th to July 25th / British School of Archaeology in Egypt. 1908. London : BSAE. Gardiner, Alan H. 1945. The supposed Athribis of Upper Egypt. Journal of Egyptian Archaeology 31, 108-111. Petrie, W. M. Flinders 1908. Athribis. British School of Archaeology in Egypt and Egyptian Research Account  (14th year). London: British School of Archaeology in Egypt; Bernard Quaritch.